Beloved author/illustrator sightings of Aaron Becker, Tomie dePaola, Judy Blume, and more; favored agent schmoozing, preferred publisher swooning . . . I’m living vicariously through my creative friends as they message me from the 43rd Annual Society of Children’s Book Writers and Illustrators (SCBWI) Summer Conference in Los Angeles. Through technology, I can be a little birdie in the corner as Elise Parsley, represented by Steven Malk, debuts as the one of Writers House’s newest authors/illustrators; Alicia Schwab meets fellow authors/illustrators represented by her new agent, Jodell Sadler, of Sadler Children’s Literary; and Kristi Herro networks to find the perfect advocates to promote her work. They generously share their experience, so I can experience it, too. I’m so happy and lucky to be welcomed along in spirit. Thanks, friends! My best wishes and support goes to them and all who work so diligently to bring joy, learning, and growth to the world through children’s literature. For all seeking to be discovered and all seeking to discover them, here’s rooting for an extra-fruitful conference. 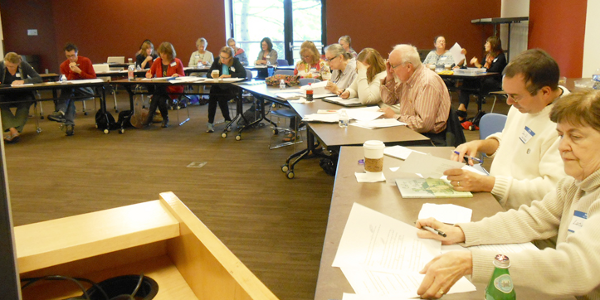 Children’s book writers all over the world have been polishing their manuscripts in anticipation of this season: Society of Children’s Book Writers & Illustrators (SCBWI) regional conference time. These events provide the inspiration and hope that keep us plugging along, one-word-at-a-time for the remainder of the year. I love conference season, because all who plunge in with an eagerness to learn are stepping closer to publication. I’m on the edge of my seat for those who are ripe to be discovered. 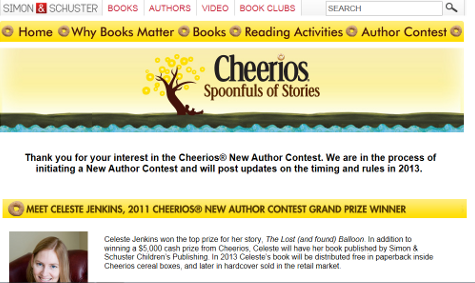 Louise Aamodt was awarded runner-up in the 2011 Cheerios Spoonfuls of Stories Contest with her picture book manuscript Frankie the Flop. 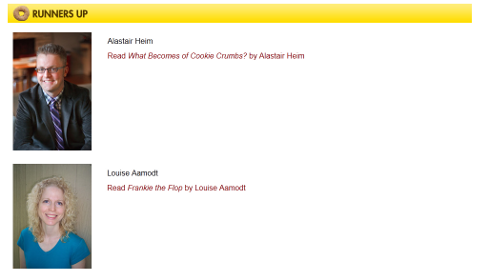 The 2011 web page is no longer available, but below are a couple of screenshots. Louise, an empathetic teacher, mother, and animal rights activist, has a gift for pulling her readers’ heartstrings and pressing their funny bones. Her smart and diverse picture books–some humorous and some dramatic–promote thoughtfulness and understanding. Whether they are underappreciated vultures or underdogs with or without tails–they’ve found refuge in Louise’s imaginative manuscripts. 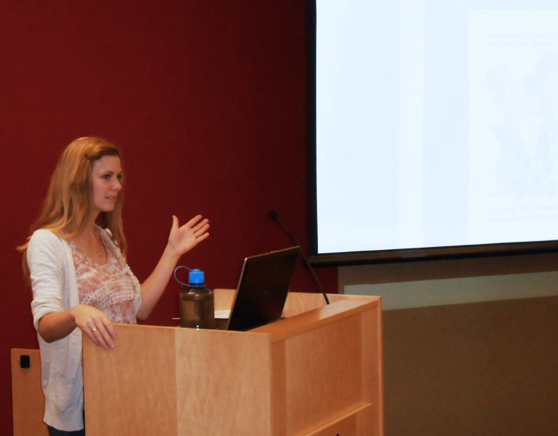 Elise Parsley, picture book writer and illustrator, recently conducted a successful, hands-on dummy book workshop that drew 24 attendees from all over Minnesota. Elise gained her dummy book creation expertise by writing and illustrating four of her own fabulous masterpieces. I laugh just thinking about Elise’s funny and charming characters. In fact, I feel like I know them–like I’m their aunt or something (well, except for the cows, although I’m awfully smitten with them). I think you’ll feel the same way. 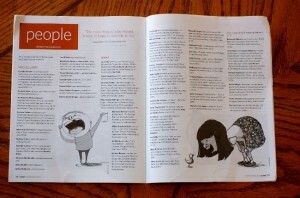 Other MN writers I’d like to endorse are Randy Holland and Alicia Schwab. Randy Holland’s middle grade mystery novel manuscript first pages blew me away when I attended my first MN SCBWI critique meet-up. I aspired then to try to write as clear and tight as Randy. He’s stocked his manuscript full of intrigue. And, he’s already busy writing the sequel, because the ideas just keep coming. 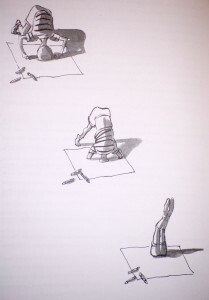 Alicia Schwab is another lucky writer who can illustrate, too. She’s got a delightful picture book ready for bedtime snuggling. If you click on her link, you can see she’s already a published illustrator, but this will be her debut as a writer and illustrator. Are you a picture book author or author/illustrator who would like to wow an agent or editor by improving the rhythm, pacing, and editing of your manuscript? 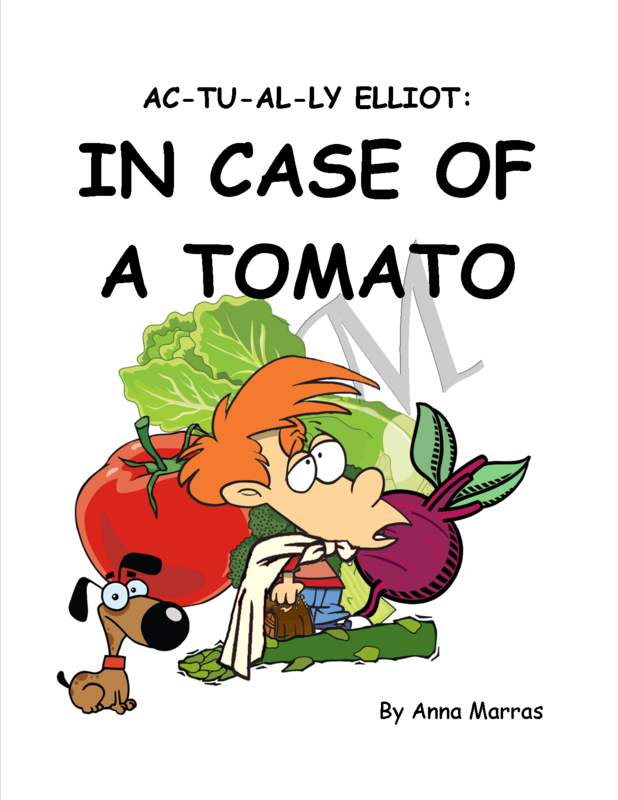 Picture Book, Dummy Book, How to Hook (an agent)! A dummy will help you flesh out your characters and pace your story. I created this dummy for my own use with the help of iclipart. Incidentally, you might learn, as I did, that your material is better suited for an older audience. Whether you are an illustrator or artistically challenged, like me, this workshop will be beneficial for you. Elise will show you the characteristics and usefulness of a picture book dummy and the basics of a PB query letter. The experience may also help you discern whether your material is truly suitable for and marketable in the picture book genre. 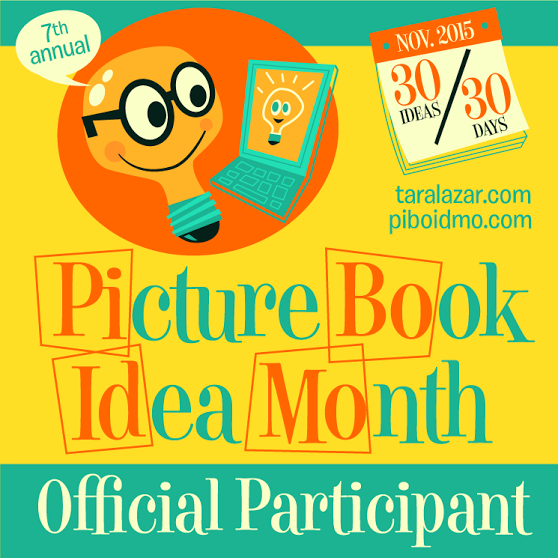 Bring a copy of your picture book manuscript, pen, scissors, and be prepared to make some edits! 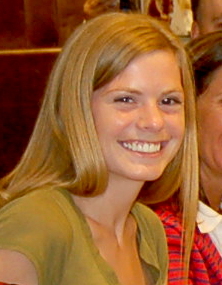 About Elise: She studied drawing and creative writing at Minnesota State University in Moorhead, MN. She has been actively researching and creating picture books and dummies since graduating in 2011. Five pieces of Elise’s spot art were featured in the March/April 2013 issue of the SCBWI Bulletin. She will share invaluable feedback she’s received from editors and agents on her way to publication. 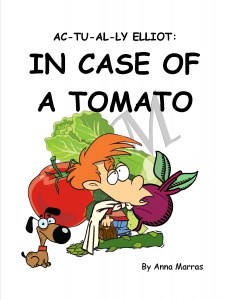 Picture Book, Dummy Book, How to Hook (an agent)! 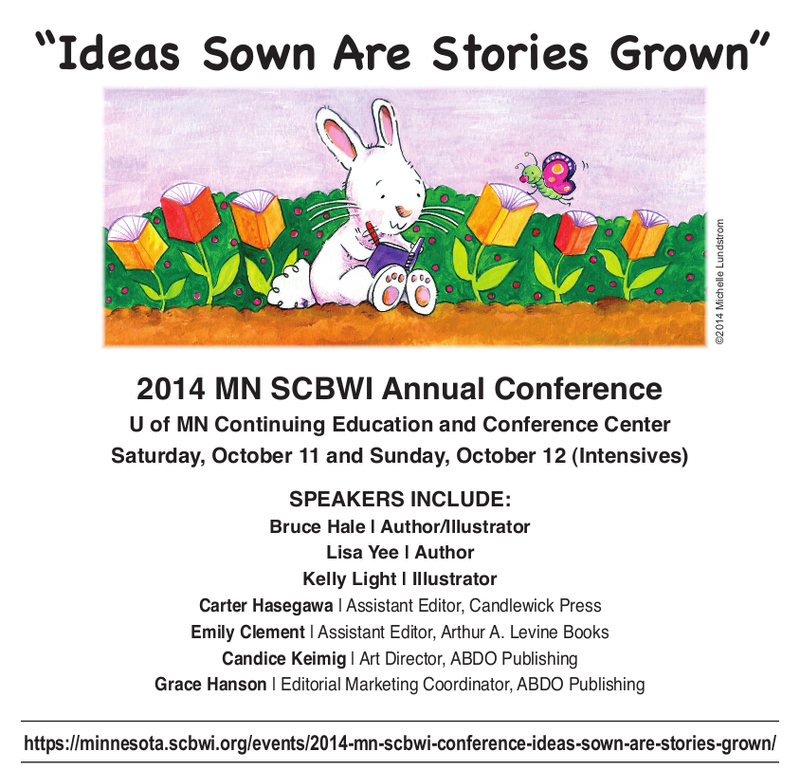 is a MN SCBWI-sponsored event. Elise looks forward to seeing you Saturday, September 21, 1 – 5 p.m. at the Maplewood Ramsey County Library, Community Meeting Room, 3025 Southlawn Drive, Maplewood, MN, 55109. 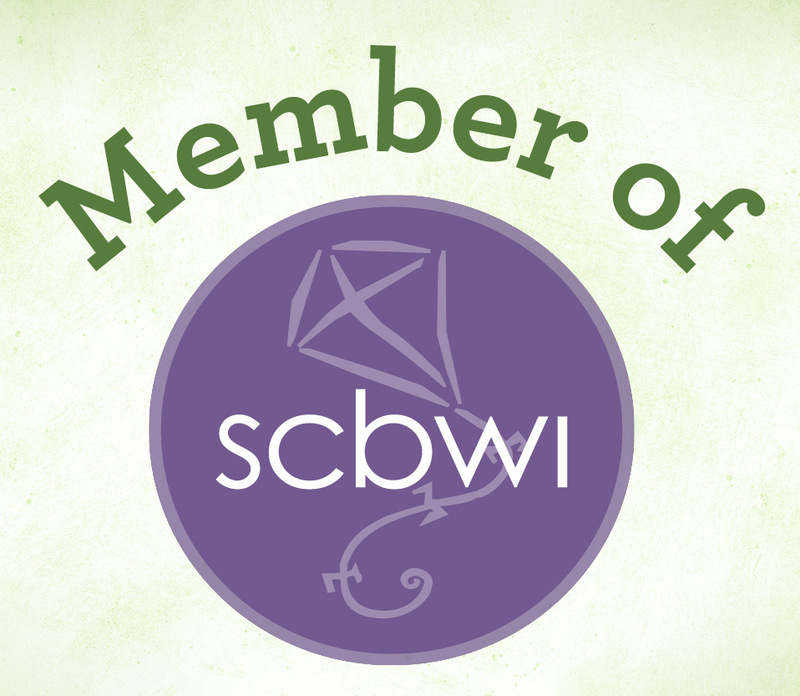 SCBWI Members: $25, Non-members $35. I feel like I just mailed a love note. And now I want to crawl into the post office box to get it back. 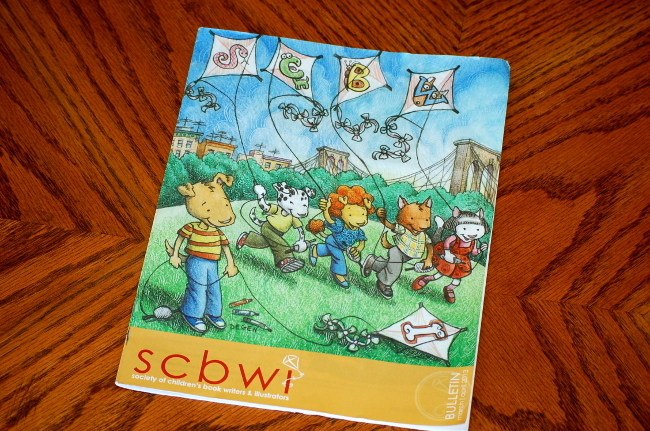 It’s that time of year again, the Society of Children’s Book Writers & Illustrators (SCBWI) conference season in the Midwest. Many of us children’s book writers and illustrators are frantically polishing treasured stories for a manuscript review. In return, we’ll receive feedback to improve our work. Critique reviews also provide a prime networking opportunity. We try to bring our best to the table in an attempt to knock agents and editors–or experienced critiquers who know agents and editors–off of their feet. Usually, we’ve never met our manuscript reviewer before. We just know he/she hangs out on a pedestal. 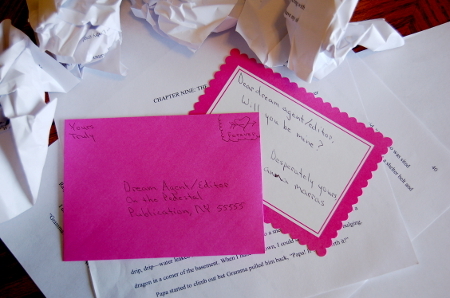 The submission process feels awkward, like sending a love letter to a blind date in hopes of compatibility. It’s extremely humbling, yet stocked with hopeful anticipation and romantic notions of finding the one who will find extraordinary worth in us and our work. Luckily I specialize in fiction. I probably should look into fantasy. Incidentally, the Minnesota SCBWI Conference will be held October 12-13, followed by the Iowa SCBWI Conference, October 18-20. I’m cheering for some lucky agent/editor to find the one in you. Before my friend Elise becomes any more famous, I have one thing to say: I know her. 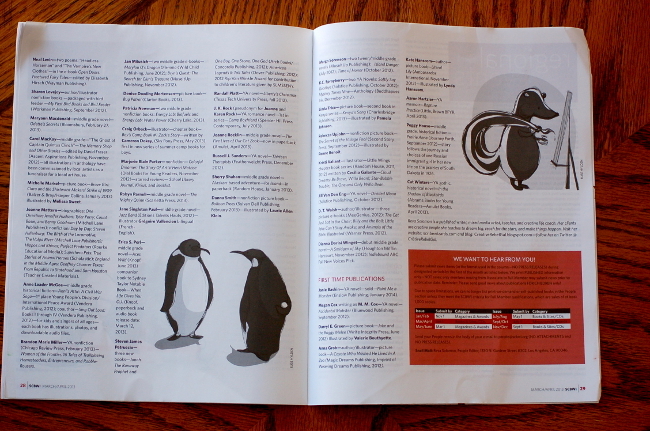 The artwork of Elise Hylden, the illustrious writer/illustrator of our KEM GEM critique group, was featured in the March/April 2013 SCBWI BULLETIN, the official publication of the Society of Chiildren’s Book Writers & Illustrators. What better endorsement? Anyway, take a gander at pages 26-29. The illustrations are Elise’s. I think you’ll agree — Elise has a bright future on the horizon. Her imaginative creations already delight us. We can’t wait until everyone can enjoy them. Congratulations, Elise! We’re so proud of you. In the inspirational words of Buzz Lightyear: TO INFINITY AND BEYOND! Could there be a cuter couple? 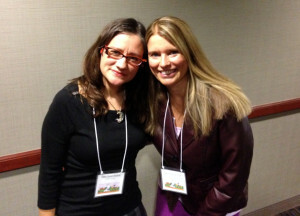 The 2012 Minnesota Society of Children’s Book Writers and Illustrators (SCBWI) Conference proved to be an ah-ha event. 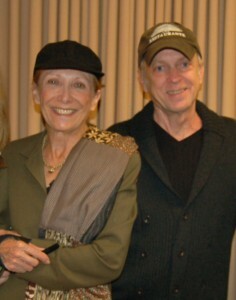 The high”lights”, endearing keynote speakers, David Small and Sarah Stewart, captivated us with their devotion to one another and their genuine interest in the dreams of novices, like me, who looked to them for encouragement. Why publish such a disturbing piece after a lifetime of success writing and illustrating conventional, light-hearted children’s books? David’s answer: For his own well-being. As a middle aged adult he still suffered. The reoccurring by-product of his youth: Post-traumatic stress disorder and cancer of the thyroid. To cope, he reflected on his past as his own psychoanalyst and used his art to fill the gaping hole of neglect in his heart. He called this process “narrative” or “cartoon medicine”. 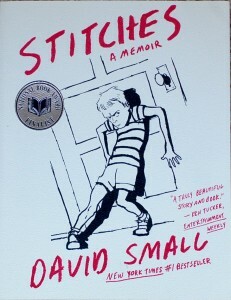 See and read Small’s jarring, line-drawn account in his NEW YORK TIMES bestselling novel, STITCHES. Sarah Stewart wrapped up the eventful day describing the co-creation of The Quiet Place — Sarah, as author, and David, illustrator. Sarah confessed that she writes to save her life as she knows it — and to keep the demons away. She recommended that we unplug ourselves and go to that slow, quiet place to meet ourselves. 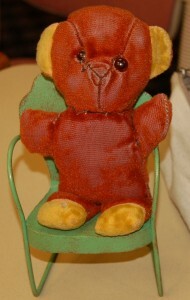 As a gift to Sarah, David incorporated her beloved childhood companion, Richard Bear, throughout her children’s books. Hidden in The Quiet Place, you’ll find another loving bonus from David to Sarah: an exquisite fold-out illustration — an elaborate quiet place for Sarah’s protagonist Isabella — a colorful contrast from the black and white drawings depicting the starkness of David’s youth. Can you find Richard Bear? The blessings go both ways. Sarah seems a seven/seventy-fold gift to David as well — a warm, loving, and sweet recompense for the cold, loveless, bitter life he once lived. Thanks, David and Sarah, for your candid mentorship and kindness. 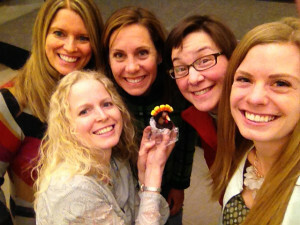 And, thanks to the MNSCBWI Conference organizers: Quinette Cook, Jessica Freeburg, Alicia Schwab, Celia Waldock, Catherine Glancy, Kristi Herro and all volunteers for once again producing a positive, memorable event! My next post: Wisdom from conference speaker, Agent Linda Pratt of Wernick & Pratt Agency. The longest minutes of my week happen when others critique my work. 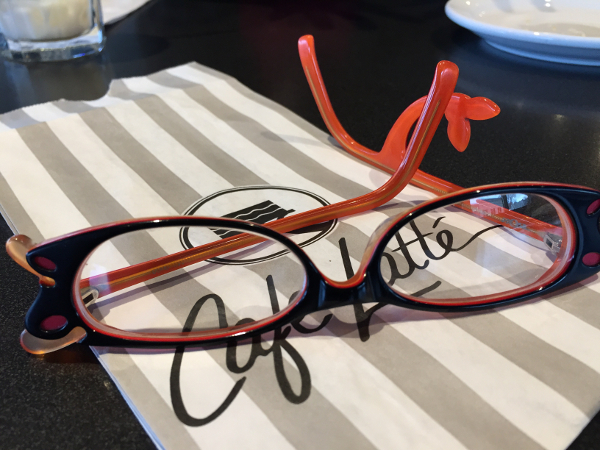 Sometimes, to cope, I daydream about how the classics would fare after Society for Children’s Book Writers and Illustrators (SCBWI) evenings at the coffee shop. Consider Madeleine L’Engle’s A Wrinkle in Time.